Holidays. My favorite time of year. NOT. Ok, sorry that was lame, but really I hate the holidays. I always have. Maybe because my parents divorced when I was a toddler, and then my mom and adoptive dad divorced when I was a freshman in college. I never really had the pull between households that most divorced kids have had, but I’ve always felt guilty this time of year. And stressed. And anxious. 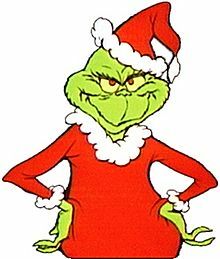 Just call me the Grinch. Bah humbug! However, in the last few weeks I have developed a new mantra. “It is what it is”. Some things just can’t be helped. Or fixed. Or made better. Some things just “are”. I am learning to be okay with this. This being life and what life may hand us. I may get angry at first. Raise my voice. Stamp my feet. Use wild hand gestures. But then I take a deep breath, shrug my shoulders, and think to myself, “it is what it is”. In the last few weeks I have been working for my friend who owns a small business. She called me in a desperate panic to act as her “customer service” rep and respond to customer’s emails. I was appalled at how rude some of the customers were despite my cheery responses letting them know we were “busy little elves” and were knitting their orders as fast as our little fingers could and assured them their orders would get to them in the “Nick” of time. At first I would get that sinking feeling in the pit of my stomach when I feel guilty or anxious, but then I realized these people needed to adopt my mantra. We were not canceling their order. We weren’t telling them we would never send it to them. We were just letting them know it might be a little later than originally noted. I mean, what did they want us to do? It is what it is. I’ve been saying this over and over this year. (And as I just look over and see that “Otto” our Elf on the Shelf did not relocate last night, I realize I will need to say it again and again!). We are incredibly blessed, but my Christmas will never look like Martha Stewart’s and everyone’s gonna have to be OK with that. Merry Everything! !